Designed and built by Golden Coast, GC Crystal chemical dosing systems provide an affordable solution to ensuring efficient, effective and automatic water management allowing owners to get the maximum enjoyment from their pool. There are dosing solutions to suit every type of installation and size of budget. 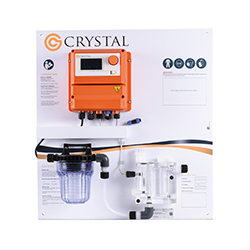 The Crystal system is an equipment range and technical support package that offers the latest in automated water treatment. 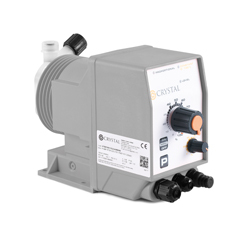 Crystal is appropriate to both pool refurbishments and new builds and the dosing pumps give proportional pH and sanitiser addition making them suitable for bodies of water of all sizes. Crystal’s team of experienced engineers are equipped to handle the whole process from conducting a free on-site survey to specifying equipment and service requirements right through to delivering a planned maintenance schedule. 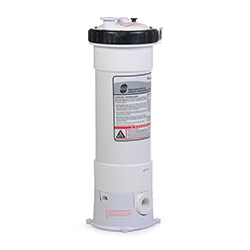 The top-of-the-range, Crystal Pro is an all in one solution offering pH and free chlorine monitoring. The twin channel controller offers a variety of outputs, such as on/off, proportional and PWM (simulated proportional using on/off pumps) operating modes, making it ideal for connecting to remote or existing dosing pumps. From the Crystal Pro to the Crystal Eco, there are three core systems in the Crystal range and we can produce bespoke systems to your exact specification.